„Intro“ includes percussion work by the young Daniel Secundus „Danny“ Fichelscher and friends. provided from the archives of Manfred Burzlaff, Hansjürgen Pohland and Jan George. Recording engineer: Peter Genée (except tracks 2, 5, 8 and 11: recording engineers unknown). Sound restoration, editing and mastering in 2013 at Audiomoto, Berlin. 6-Page-Digipack CD and vinyl LP, comes with new editorial work and original photos. “Busting The Bongos” presents previously unknown tapes with film music and photos from the year 1960, provided from the Berlin archives of Manfred Burzlaff, Hans Jürgen Pohland and Jan George - the lost sounds of "jazz phantom" Tobias "Toby" Fichelscher (1927-1992). Toby belonged to the leading German jazz musicians of the 1950s. As a regular guest he sang and played at the German Jazz Festival and was a two-time poll winner. Through his performances in many Berlin clubs, in legendary venues such as the "Riverboat" high above the Fehrbelliner Platz or the "Eierschale" at the Breitenbachplatz, he helped to make jazz popular again after the war. Toby performed without fluent English as a blues and jazz singer, scatted and played the bongos in the powerful style of his role model, the Afro-Cuban percussionist Chano Pozo ("On Chano's Track"). Before the Berlin wall was built, he was also known in the local jazz scene as an eccentric "5-finger boogie pianist '. The man regularly appeared in the clubs of Berlin with the band of vibraphonist Manfred Burzlaff. Here, even the young and then-unknown jazz drummer Joe Nay could mainly be heard with Toby Fichelscher and the quintet of Manfred Burzlaff. For the record company Bertelsmann Fichelscher sang some rock 'n' roll songs. In addition a few of his blues and jazz recordings have been released on vinyl EPs by labels like Brunswick and Amiga. 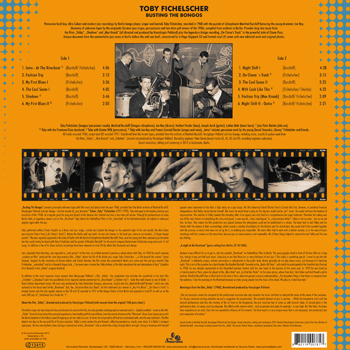 Jazz, especially from Germany, was regarded as "cash poison" at the time, so no label wanted to produce a whole album with Toby. 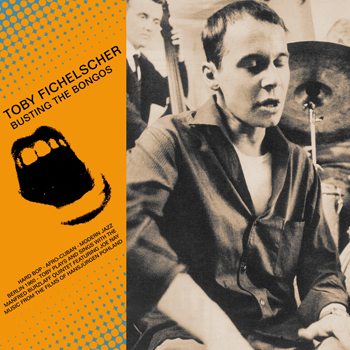 In 1960 the small company "modern art film" produced the semi-documentary film "Tobby" about the life of the Berlin jazz singer Toby Fichelscher - "a film beyond the routine" (press release). Inspired by the revolutions of former Italian and French directors the film shows the existentialist Berlin jazz scene and the real jazz beatnik Toby Fichelscher, "unmasked" and in a Nouvelle Vague style. "I've never seen a movie like Tobby before, a film that reproduces the real atmosphere of Jazz" (Joachim Ernst Berendt in the "Tobby" program booklet). In addition to the most important music excerpts from Hans Jürgen Pohlands film "Tobby", the compilation also includes the soundtrack to his short film "Schatten" ("Shadows") and tiny soundtracks to his regional cinema commercial for “Max Knaak" ("Fashion trip ") - back then well known as one of Berlin`s finest fashion department stores. All music was performed by Toby Fichelscher (bongos, percussion, vocals) and the “Manfred Burzlaff Quintet”, which was only replaced by the house band of the “Riverboat” club, the "Firestone Dixie Jazz Band", for the traditional jazz version of "My First Blues". "On Chano's Track" is already known and the only regular release on this CD and LP, recorded in 1957 at the Amiga Studio in East Berlin and pressed on vinyl EP as well as on the early GDR jazz LP "Traditional Jazz Studio No. 1 ". The Berlin singer not only shows his face and devotes his voice to the film, but also provides autobiographical material and its - slightly modified - name as the title: "Tobby" draws his inspiration from personal experiences, from dealing with his two children, from the sounds of waves at the “Wannsee” shore, from a boozy party with the Berlin beatniks or the hollow sound of tapping on an iron tube in a ruin. In short, he is inspired by all that he is confronted with, what he sees and hears. The film depicts two days in the unusual life of the jazz musician. Tobby's music pushes the plot forward, reflecting experiences, moods, even noise. It is Tobby's strongest expression. He has new rhythmic ideas during a musical jam at the "Riverboat" club or while bike riding through Berlin at night. Living in harmony with himself appears more important to him than a high salary as a pop singer. His Afro American friend Charles Francis Conrad tells him, however, to purchase financial independence. But Tobby cannot decide himself. The music he would have to play on this big tour would not be "his" music. He would not have the freedom of improvisation. The reaction of Tobby towards this tempting offer of an agency was only fixed in a comprehensive ten-page treatment. Therefore the cutting was one of the main factors in intensifying the story and paved a new way for "inner monologues" or "consciousness fades". Tobby is not an actor - just as we see him, he lives. That makes the film production very special because the atmosphere could not be established in a studio. The team had to visit Tobby and his friends with the camera in their surroundings, which caused a number of problems for the director and his technicians: the sound had to be recorded together with the pictures, in rooms that were not set up for it, so dubbing was impossible. The team often had to work with a hidden camera, or in the case of music recordings with four cameras at the same time, because jazz as improvisation is not repeatable. All of these things helped to capture the real Tobby and his true jazz feeling. Anyhow it was difficult for us to get in, into the crowded "Riverboat" on Fehrbelliner Platz in Berlin. The young people stood in front of the box office in a long line, though it was just half past seven. Surprising to me that there are so many followers of real jazz! This really is something special. I want to say that the "Riverboat" is definitely unique, without concessions or adjustments to the public taste. Bands generally do not play dance music, just because it is Saturday night. This is out of the question for a band leader like Manfred Burzlaff. Formerly in the "Berlin All-Stars", with which he participated at the Frankfurt Jazz Festival in 1958, he was already represented at the Düsseldorf amateur festival with his own band in the autumn of the same year. In 1959 he was hired by a French pianist in Paris, where he played at the "Blue Note" and "Le Chat Qui Peche". In the same places, where Stan Getz, Chet Baker and Bud Powell used to perform. Manfred Burzlaff likes to think back to his time in Paris, where he gained so much professionalism: "The important thing is that there is a response from the audience. I like the evenings at the Riverboat because so many young people love the music of my band. We play in a hard bop style." "The jazz musician cannot be compared to the professional musician who only recreates the music and tries to interpret the music in the sense of the composer. For the jazz musician existing melodies are just a suggestion for improvisation. The essential element of jazz is creation ... While the interpretive artist puts the musical performance and thus the mastery of the art form in the foreground, the jazz musician has to come up with musical ideas. In second place is the performance that, of course, must be adequate. The affinity with creative artists - such as painters and poets for example - is very high. But like them, he draws from inspiration as an artist, from the non-repeatable influence of the moment. The final result is a very unique music that is not composed, not constructed, but pure expression of emotion. " Special thanks to Manfred Burzlaff, Hansjürgen Pohland and Jan George. compilation, production and liner notes: Ekkehart Fleischhammer.